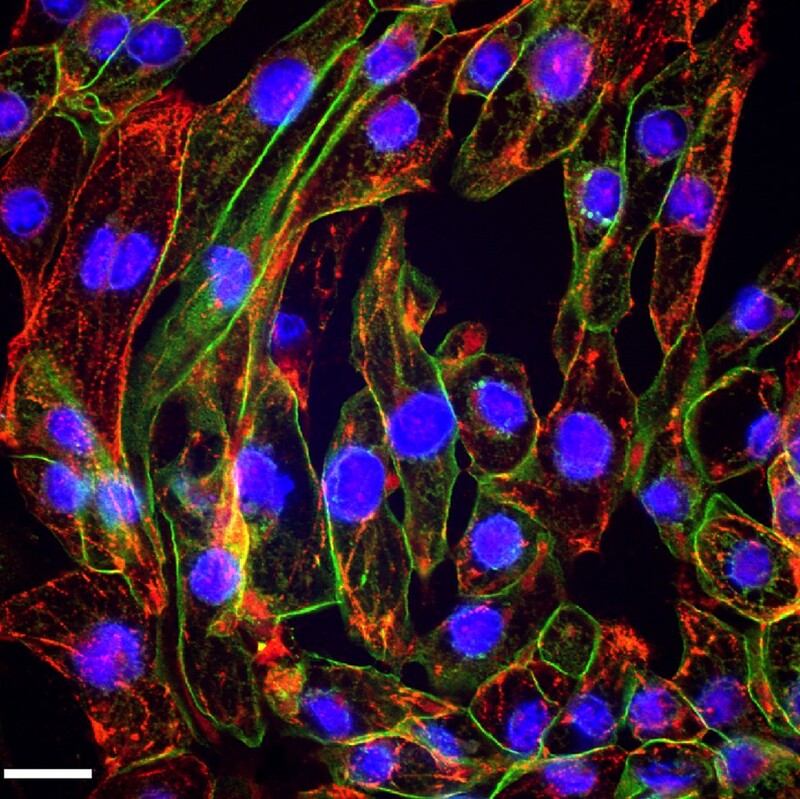 Human iPSC-Derived Cardiac Cells contain i-HCm make a powerful in vitro platform to study cardiac physiology and disease, and to assess therapeutic compound efficacy, safety and toxicity1-3. Top: Beating 3D printed cardiomyocytes (i-HCm) and other cardiac cells from (left) neonatal and (right) adult. Printed i-HCm derived from adult iPSC exhibit strong beating at 72 pulses per minute while neonatal i-HCm demonstrate weaker, faster beat rate. Bottom: Cultured i-PSC-derived cardiac cells pulsate in vitro. 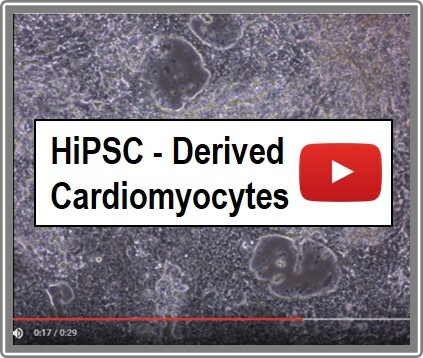 These iPSC-Derived Cardiac Cells are differentiated from integration-free Human Induced Pluripotent Stem Cells (HiPSC), which are fully validated for pluripotency and cultured under feeder-free conditions before cryopreservation. Through a robust serum-free, chemically defined protocol, high yields of fully functional Cardiac Cells are obtained and cryopreserved. Of note, the i-HCm and other cardiac cell populations are not purified through genetic selection, and thus there is no risk of genotoxic stress due to molecular manipulation. Furthermore, cellular preparations include accessory cellular populations resident in the human heart, which are crucial for correct cardiomyocyte physiology2, 4. 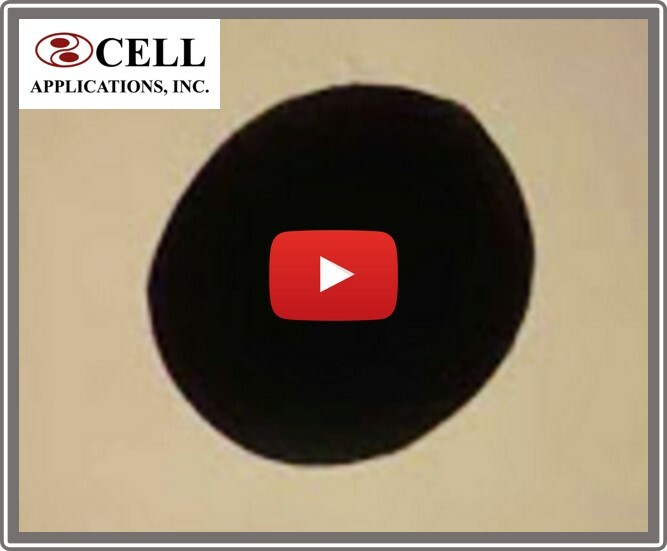 Post-thawing viability and plating efficiencies of the cells are typically higher than 50%. After plating at the recommended density, the cells will show spontaneous synchronized beating, and will express typical cardiomyocyte markers, such as the contractile proteins cardiac troponin T (cTNT) and sarcomeric alpha actinin (SaAct). The cardiomyocyte content of our preparations is determined by flow cytometry analysis and quantification of cardiac troponin T positive cells. These iPSC-Derived Cardiac Cells are also tested to ensure the absence of microorganism contaminants. Independent assays: From electrophysiology and multi-electrode array analysis to high content microscopy and viability screens. Cardiac Disease modeling: To date, interesting phenotypes of several genetic-based cardiomyopathies have been successfully replicated in a dish through the use of patient-specific i-HCm. Examples include Familial Hypertrophic, Dilated, and Arrhythmogenic Right Ventricular Cardiomyopathies1-3. Cardiac safety and toxicity: Cardiac toxicity is an important contributor for the failure of therapeutic agents in late stages of clinical trials, as well as for the removal of approved drugs from the market. Through the CiPA initiative, which brings together researchers from institutions such as the FDA, academic institutions and pharmaceutical companies, i-HCm are being evaluated as an integral tool for the safety assessment of developing drugs5,6. Zanella F., R. Lyon and F. Sheikh. 2014. Modeling Heart Disease in a Dish: From Somatic Cells to Disease-Relevant Cardiomyocytes. Trends Cardiovasc Med, 24:32-44. Passier R., V. Orlova and C. Mummery C. 2016. Complex Tissue and Disease Modeling using hiPSCs. Cell Stem Cell, 19:309-321. Moretti A., K. Laugwitz, T. Dorn, D. Sinnecker and C. Mummery. 2013. Pluripotent stem cell models of human heart disease. Cold Spring Harb Perspect Med. 2013; 3(11). Burridge P., S. Metzler, K. Nakayama, O. Abilez, C. Simmons, M. Bruce, Y. Matsuura, P. Kim, J. Wu, M. Butte, F. Huang and P. Yang. 2014. Multi-cellular interactions sustain long-term contractility of human pluripotent stem cell-derived cardiomyocytes. Am J Transl Res, 22:724-735. Cavero, I. and H. Holzgrefe. 2014. Comprehensive in vitro Proarrhythmia Assay, a novel in vitro/in silico paradigm to detect ventricular proarrhythmic liability: a visionary 21st century initiative. Expert Opin Drug Safety, 13:745-758. Fermini B., J. Hancox, N. Abi-Gerges, M. Bridgland-Taylor, K. Chaudhary, T. Colatsky, K. Correll, W. Crumb, B. Damiano, G. Erdemli, G. Gintant, J. Imredy, J. Koerner, J. Kramer, P. Levesque, Z. Li, A. Lindqvist, C. Obejero-Paz, D. Rampe, K. Sawada, D. Strauss and J. Vandenberg. 2016. A New Perspective in the Field of Cardiac Safety Testing through the Comprehensive In Vitro Proarrhythmia Assay Paradigm. J Biomol Screen, 21:1-11. Cryovial Non-proliferative 2,000,000 i-HCm in freezing med. Zanella F., R. Contu, R. Lyon, V. Mezzano, A. Castaneda, S. Perez, J. Wojciak, J. Roberts, C. Carromeu, G. Keller, A. Muotri, M. Scheinman and F. Sheikh. 2015. Arrhythmogenic Right Ventricular Cardiomyopathy hiPSC-derived cardiomyocytes show disease phenotypes correlating with clinical data from donor patients. ASCB, B1678/P2419 (118). Zanella F., R. Contu, R. Lyon, V. Mezzano, A. Castaneda, S. Perez, J. Wojciak, J. Roberts, C. Carromeu, G. Keller, A. Muotri, M. Scheinman and F. Sheikh. 2014. Human Induced Pluripotent Stem Cells Recapitulate Disease Manifestations and Severities of Patients with Arrhythmogenic Cardiomyopathy. Stem Cell Meeting on the Mesa. Zanella F, V. Mezzano, R. Lyon, C. Carromeu, G. Keller, A. Muotri, M. Scheinman and F. Sheikh. 2013. Human induced pluripotent stem cell models to uncover mechanisms underlying varying clinical symptoms associated with Arrhythmogenic Cardiomyopathy. Cell Symposia: Using Stem Cells To Model and Treat Human Disease, Session I: Modeling Disease Using Stem Cells.